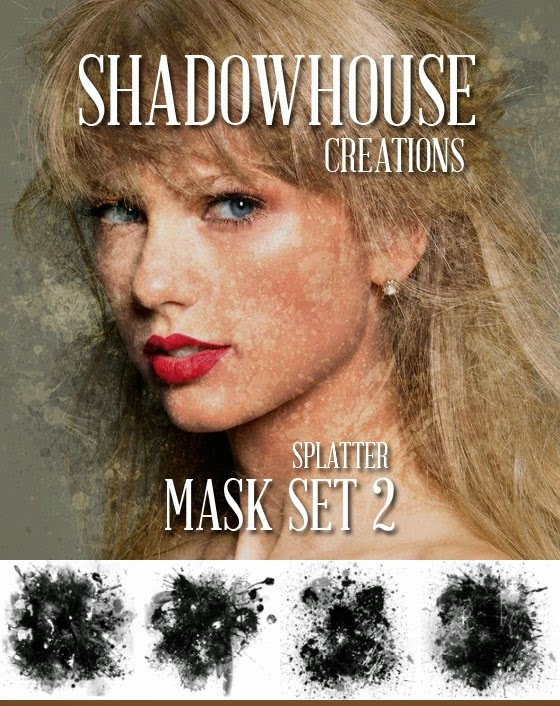 Shadowhouse Splatter Mask Set 2 contains: Actually this set should be set 3, my bad! Easy To Use: Just open and drag a layer mask on top of an image and adjust photoshop's layer mode and opacity to ones liking. SHOWING ALL 4 MASKS USED, ALONG WITH SOME SOLID COLOR FILLED LAYERS TO ADD MORE COLOR TONES. THATS IT, I FEEL SATISFIED WITH MY RESULTS, I FLATTEN MY LAYERS AND SAVE AS. Thank you, Jerry, for the tutorial as well as the Mask set. Hope you are well, or at least holding stable. Your work and your gifts to all are appreciated. Thanks Jerry... good to see you back and sharing again! You are appreciated for your talent and your generosity! Welcome back, mate! Hope you are feeling better. Thanks Julie, things are looking better and I should have something new posted in the next day or two. Thank you so much for all your hard work, your resources are nothing less that exquisite gorgeous awesomeness! Cheers! Thanks so much for such great brushes and tutorials. I learn alot from you.